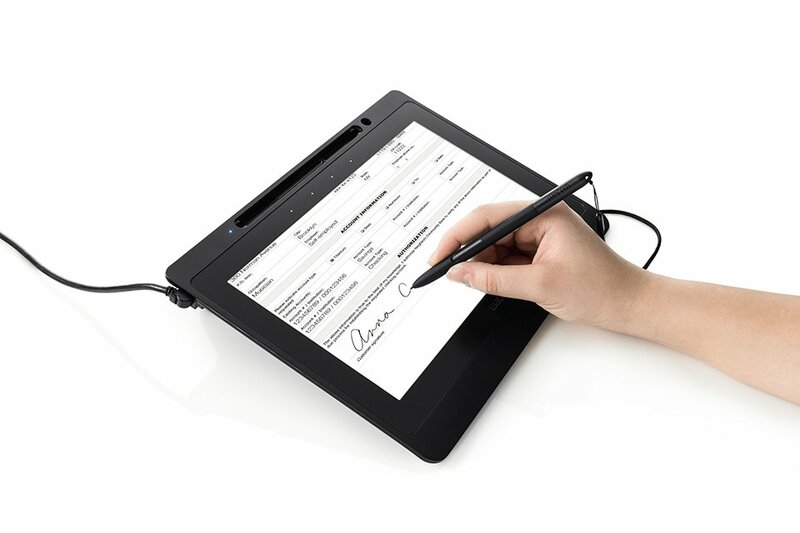 The DTU-1141 is the leading eDocuments and eSignature solution in Wacom’s portfolio. This is a unique product that combines a 10.6″ Full HD resolution LCD, state-of-the-art encryption, and power from just one USB cable, to provide an ideal document viewing and signing experience. The DTU-1141 has all the features necessary for a best-in-class eDocuments solution. The vivid 10.6″ LCD supports multiple resolutions up to Full HD to provide a great experience with any business software application. For security, the DTU-1141 includes state-of-the-art encryption, plus unique hardware ID to identify the individual unit that was used for signing. Four touch-activated ExpressKeys allow easy access to commonly used shortcuts. As with all Wacom products, the DTU-1141 is extremely durable and can be easily integrated into any existing environment. The pen is cordless and battery-free, making it light and strong. The unit can be used while flat, supported at a comfortable angle with the integrated stand, or attached to a 3rd party arm or stand with the VESA mount. Please contact us for more information about how the DTU-1141 can fit into your workflow.